Sail through Southern Europe, from Portugal to Spain, on board this seven day voyage on Silversea's Silver Spirit. Departing Lisbon, Portugal on 25 April 2015, Silver Spirit sails to Huelva, a city in southwestern Spain, which is filled with traditional Spanish plazas and historical monuments. Silver Spirit continues her voyage to Gibraltar, a tiny British colony, whose impressive silhouette dominates the strait between Spain and Morocco. Guests have the opportunity to sight the famous Barbary Apes at Apes' Den and enjoy a cable car ride to the top of Gibraltar, providing incredible views across Spain and Africa. The next port of call is Málaga, where guests can meander the historic city centre, discovering such attractions as the Alcazaba, Museo Picasso and Málaga's Cathedral. Silver Spirit then travels to Cartagena, a beautiful city located in the region of Murcia, before sailing to Valencia, Spain's third largest city. While in Valencia, guests can visit the city's 13th to 15th-century cathedral, explore the city's futuristic complex, Ciutat de les Arts i les Ciéncies, and enjoy the world-renowned Valencia oranges. Silver Spirit then spends her final night in Barcelona, where guests can explore the cobbled streets of the Gothic Quarter and witness iconic Gaudi architecture, including La Sagrada Família and Casa Batlló. After an evening of discovering what makes Barcelona one of Spain's most attractive cities, guests disembark on 2 May 2015. Prices are per person starting from AU$3,650 in a Vista Suite double occupancy. 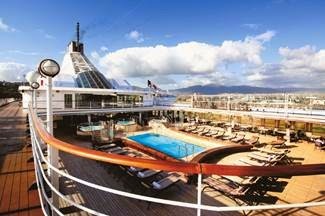 Silversea fares include: all-suite accommodation with butler service; gourmet meals with menus inspired by Relais & Châteaux; complimentary wines, Champagne and spirits served throughout the ships; and all gratuities.